Good on you to stand up for Bon Jovi. I’m a fan. Still waiting on them to deliver a good album. I loved the first, the second was just ok, the third was great and New Jersey used to be my favorite. Keep the faith was interesting and I loved These days. Have a nice day was ok again. Loved, I mean loved Crush. bounce was okey. After that I haven’t really put much effort in listening to new Bon Jovi albums. I usually like the singles but the latest one This house is not for sale I just can’t get into. There’s just something really wrong in that one. What do u think about This house is not for sale? We have very similar favourites. I loved These Days and I’d argue it’s among their top five easily. I actually like it better than Keep the Faith! I didn’t like This House is Not For Sale, but I didn’t buy it and probably didn’t hear the whole album. The last one I truly loved was Bounce and that’s a long time ago now. “Wanted Dead or Alive” is a great song, one of my favourite Bon Jovi songs and what you say about “Slippery When Wet” is true too. That album has given me two thoughts about the band over the years. One- Bon Jovi represented everything that was wrong with heavy metal in the 80s, topic for debate. Two- guys like us suffered Bon Jovi because our girlfriends were so into them. Hey at least I could listen to Bon Jovi with a girlfriend. Couldn’t do that with Priest! I don’t think Bon Jovi represented what was wrong, but perhaps they enabled a lot of bands that weren’t as good. 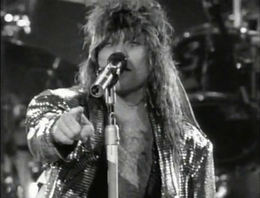 With Sambora in the band, Bon Jovi is really above all the wannabe’s. And Tico Torres is no slouch at all. I don’t know, I dated a lady who was into Priest as was my sister. No, you can’t fault Rick or Tico, they’re great musicians. I put that statement out there because I heard someone say that once and I thought it would be a good topic for debate. I watched a recent Bon Jovi live performance of This House is Not For Sale. I felt like the band weren’t a real band, and that Jon’s voice has REALLY gone downhill. No power left at all. I’d heard Livin’ On A Prayer before this but the single for this was the first Jovi I bought. One of the first singles I bought actually! Was just the 7″ I had. Don’t have it any more… can’t even remember what the B-Side was! I’m gonna go look for my copy and tell ya. Also I found my WASP Scream Until You Like It 7″ in the same box, I’m sure you’d like that one. I had a look on Discogs. The one I got had Shot Through the Heart as the B-Side. Interesting. A first album cut! I actually got into the band starting with Runaway so I beat the rush with the ladies. But I agree on Slippery…some good songs but only an okay album. Wanted Dead or Alive was the best and when they did the acoustic version with Prayer for MTV Video Music Awards, Wow!! They actually went up a notch for me at that point. A really great song. Wow you were onto them early! The first Bon Jovi album is incredible. Truly a great song. But you know what, to their credit, they have never tried to copy it. Blaze of Glory is a very different kind of song. I am glad they didn’t copy it. They were good about not repeating themselves back then. Now each album is the same. Agreed. Back then, even all their ballads were different. Bed of Roses didn’t sound like I’ll Be There For You which didn’t sound like Never Say Goodbye. I think they first repeated themselves a little bit with (maybe) This Ain’t a Love Song which I thought was similar to Always. And then for sure with It’s My Life. I don’t know enough about their albums to convince me that they’re not the sum of the majority of the singles I’ve heard (decent rock band, but more recently dreadful pop rock act), but there are a handful of tunes I like a lot. … and I really like this tune… I would sing along to if it was on during a night out. One of the songs I know and like. In fact, I know pretty much everything off that album! I didn’t like some of the more basic tracks like “I’ll Sleep When I’m Dead”, but I loved the more progressive stuff. I love this track too, you just can’t knock anything about it. It sounds so teenage and hopeful to me. CIRCUS Mag had an add for the debut back in 84. I took the plunge liked the album. Bought 7800 and did not like it at all. Jovi is lucky man as he dodged a bullet on that second record but stepped up totally for Slippery…How many bands can get away with that? Totally man. I’m glad you agree with me on 7800. Not everybody does. It’s funny, both my sister and I got it for Christmas one year. Probably 1989 or 1990. We were both rocking the tapes separately on our Walkmans. Right from the first listen I said “It’s not very good aside from the hits”. I liked Silent Night at the time, but now I just snooooooooze. You’ll have to 9/10th Filler that one! I count myself among the million faces rocked by this song! I have a feeling it’s gotta be more than a million by now. Never could get into this band. Were you humming ‘Dirty Deeds’ as you changed those names in the sand? I know I would be, ‘Beavis and Butthead style’. Actually at that time I was REALLY into Jailbreak. I got it around that time and loved it. Everything about it. And the music video too. Ha, yeah. It’s Mark Evans. A different video for the band, for sure! So true. I like how the Young always found short guys to be in the band too. Like there is a maximum height requirement. This was definitely their best period, and that’s a strong tune for sure. Right on.